There are 3 main types of Finn raced in the UK. These are the Classic (pre-1985), the Modern Race Boat (post-1985) and, becoming very popular, a Classic with Carbon combination. Classic Finns are identified as any boat built prior to 1985. They can be wood, GRP or a combination. The purists say a Classic Finn should sail with an aluminum or wood mast and a Dacron sail but more recently the British Finn Association has embraced the growing trend for ‘Classics with carbon’ allowing pre-1985 boats to sail with modern rigs in order to make them more competitive. As a starting point, a budget of around £2,500 or so will get you a reasonable Vanguard or other GRP boat in a good sailing condition, if you can find one! At the time when they were the boat to have they were raced hard by the top guys for many years so some do look a bit tired but this should not put you off. The suspicion is that many Finn hulls were built too stiff and needed to soften up, very different from other classes where the peak racing life is short. 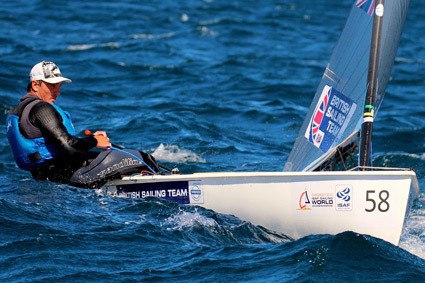 As a result, it is quite possible to get hold of a good boat that has been through several Olympic campaigns. If looks are important, you can strike it lucky with an immaculate hardly used glass boat. There are many manufacturers of GRP boats including Tiptree, Mader, Vanguard, Butler, Lanavere and Pata-Lemeux, all will probably need some work but will generally be sound hulls. If you prefer a wooden boat some of the main manufacturers include Fairey Marine, Taylor, Morrison, Radaschall and Warwick. Many boats have been restored to beautiful pieces of furniture but the very stiff hulls make them less competitive than most glass boats in waves. You may be able to pick up an old unrestored boat for a few hundred pounds but there will be much work to do, including allowing for a wider range of mast movement and loads of painting. Decks may also need replacing – this is especially the case with the older boats when the glues used to build them were not as good as those available today. Restoring an old classic boat can be great fun but may not get you out on the water very quickly! Much more detail on classic boats can be found on the Classic Finn Website, where there is a register of the classic boats known to have been built in the UK. 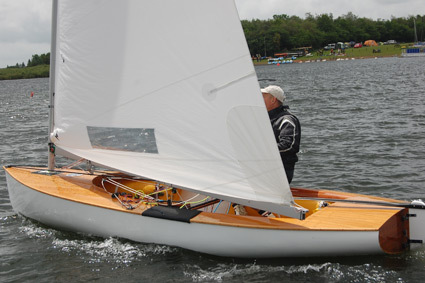 An older Finn can be updated with a modern rig and may be almost as fast as a modern Finn. This is popular because modern rigs can be obtained relatively cheaply by sourcing second-hand masts and sails and there are many older hulls available very cheaply. This is the ‘Classics with carbon’ class and is a low cost entry into Finn sailing while still being reasonably competitive and easy to get up to speed using all the current tuning guides and techniques. Modifying the deck to allow the mast to be moved forward is a sensible modification, as it helps to balance the rig. Older boats sailing with alloy rigs and Dacron sails are classed as Classic Finns. The set up and tuning of these boats is quite different and is covered by the BFA produced Finn Sailing Manual. This is written for the 80’s standard Vanguard/Needlespar 3M/ North Sail combination. Not many wooden masts survive since they often broke but they are occasionally used on Classic Finns. The Needlespar mast bend characteristic is very different from a modern carbon mast so modern sails do not work very well, which is why a Dacron sail is preferred. Early carbon masts were round and built to match the Needlespar bend so sails from the early 90’s in Dacron built for these masts can be used. Use of a carbon mast, of any design however puts the boat into the Classics with carbon class to avoid awkward disputes! 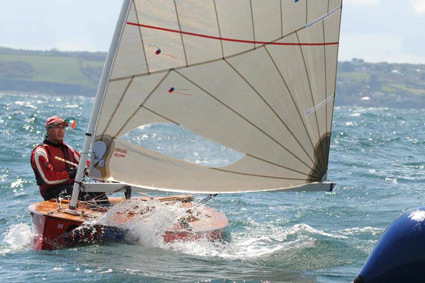 The BFA is keen to welcome all Classic and Classic with carbon sailors to its events and has elected classic expert Peter Vinton to the Committee to oversee their interests. Contact Peter if you need any further information of advice on classics racing. In the United Kingdom the most commonly raced modern boats are made by Devoti, Pata, Hi-Tech and Wilke, with the Devoti and Pata being the most prevalent and available on the second-hand market. Petticrows Finns have recently entered the market, led by one of the original Devoti Finn partners. Finns hold their value and are not cheap to buy new or secondhand. The second-hand market is buoyant but not well endowed with boats. On average, one boat a month appears on the Finn class website forum and on other Finn supplier sites. However, it is rare for a boat to stay available for very long. There is little to go wrong with a modern Finn, they are built solidly and do not have any commonly occurring defects that prevent a boat being competitive, (except for the nut on the end of the tiller!) Frequently on examining a modern Finn, you may find what appears to be extensive cracks on the foredeck along the gunwale. These are particularly noticeable on the clear-decked boats. These cracks are normal and an indication that the boat has light decks, the cracking is not structural and caused by the deck flexing but the hull not moving as the boat goes over waves. Plus version being slightly fuller in the bow. The Pata hull is said to be slightly flatter in the after section enabling it to plane earlier and therefore faster off-wind. The difficulties of building a Finn with modern materials to the strict minimum weight requirements combined with the various weight reductions in hulls over time means that most boats will now carry some lead. The location and quantity of lead is important to check both in the boat and on the certificate. The weight reduction in the mid 2000’s allowed for the introduction of a digital compass. If the boat does not have a digital compass the chances are high that it has not been weighed to the new rules. The two most commonly available hulls in the UK are built by Devoti and Pata. Devoti have been building competitive GRP Finns since the early 1990’s and the Pata boats, although now built in Hungary, come from a long tradition of Finn building. All makes of boat built after the mid 1990’s are competitive with only some small subtle changes made to the hull shape and deck layout over time. Expect to pay from £3000.00 for a hull built in the 1990’s and at least £6000.00 for a mid-2000’s hull. Many of the most competitive boats were built from around 2002 and can go for considerably more money, especially if complete with mast, sails, and trolley/trailer. If you are willing to look outside the UK boats are available from dealers in Holland and France, but you will need to register them in the UK and get a UK sail number before you start to race.